When we were in Italy earlier this year there were multiple days where we had pizza for lunch and dinner (and maybe for a snack). Why not??? 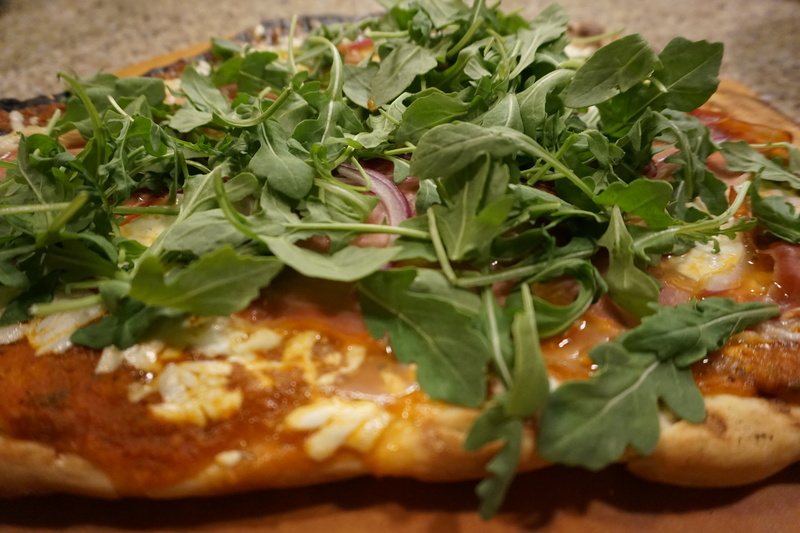 The pizza was so fresh, there were endless topping variations and it was so much better than anything we can get in DC that it seemed a waste not to! After years of living in a pizza desert there are finally a couple decent places in DC (looking at you Ghibellina and Pizza Paradisio). However, there is something really satisfying about making it yourself – you get to play with dough and also control the quality of your ingredients. Best of all you can pile on all the cheese you want with no judgement. Baking pizza in the oven works, and perhaps I will do a post on that later, but grilling is where it’s at. 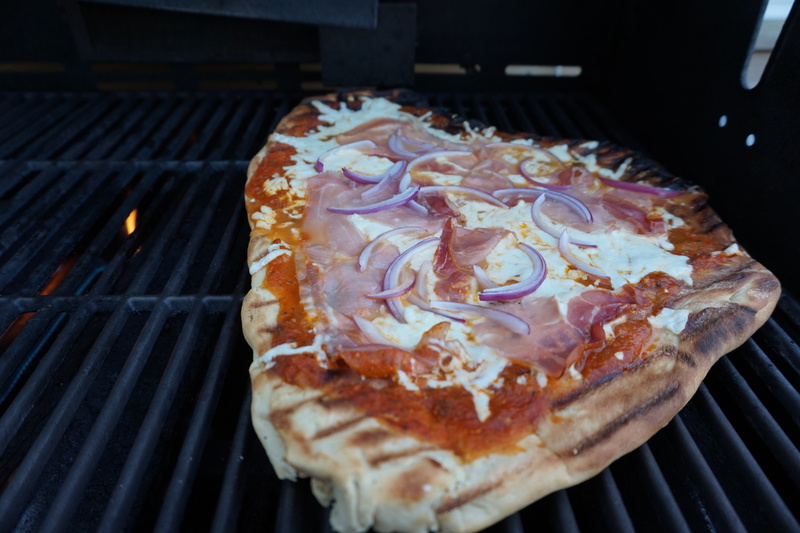 The open flame creates some good char and the heat of the grill acts as a pizza oven when you close the lid. It won’t quite reach the epic 700 degrees or so those Italian wood fired ovens get, but it’s close enough. This go around I decided to make my own dough but you can easily buy dough from most supermarkets or your local pizza place. The key to working with pizza dough is letting it come to room temperature before you try to roll it out. It’s very elastic and even more so when chilled, so instead of fighting with it for an hour you should let it sit out for about that long before you want to use it. Just make sure to cover it with a towel or plastic wrap so it doesn’t dry out. Warning: if you are a perfectionist then grilling pizza is not for you. You are not going to get a perfect circle pizza and it is not going to cook 100% evenly. That’s part of the charm for me. Here I make our house specialty – the Nustello pizza (Nustello was our celebrity name before we got married, like Tomkat but with pizza). When Patrick and I were first dating we went out for pizza a lot and came up with this pie. It had the required meat for him (prosciutto), cheese for me (mozzarella) and green (arugula) to cancel out the cheese and the meat! Use any toppings you would like, this is really just a methodology. Would love to see your pizzas on instagram, just tag @acapitolcontessa. Since I made my dough I just let it rise on the counter and hang out until I was ready to use it. If it has risen again all you have to do is punch it down. If you bought your dough just make sure it is nice and room temp. Flour your surface so it doesn’t stick and just start working the dough into a flat circle with your hands. 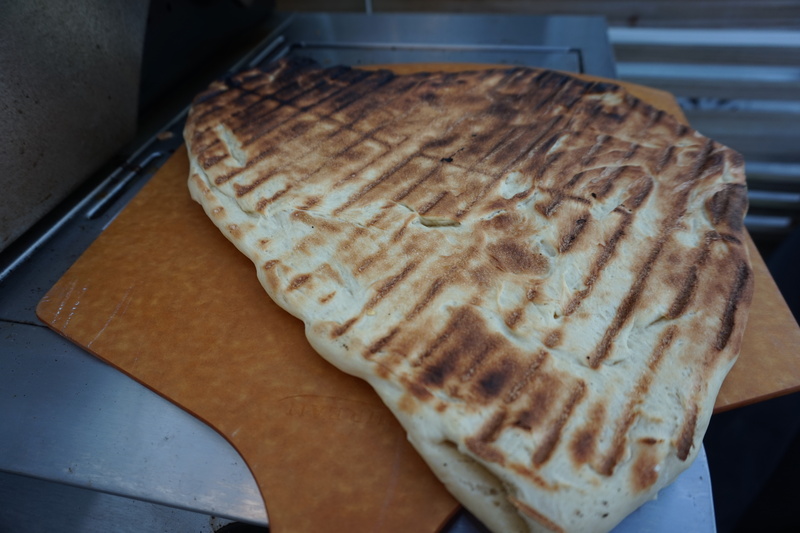 There is no real trick to this, you just stretch your dough until its thin and in the shape you want. I would suggest starting with smaller pizzas for your first try as its easier to control. Don’t worry if some parts are thinner than other, again this is part of the charm. 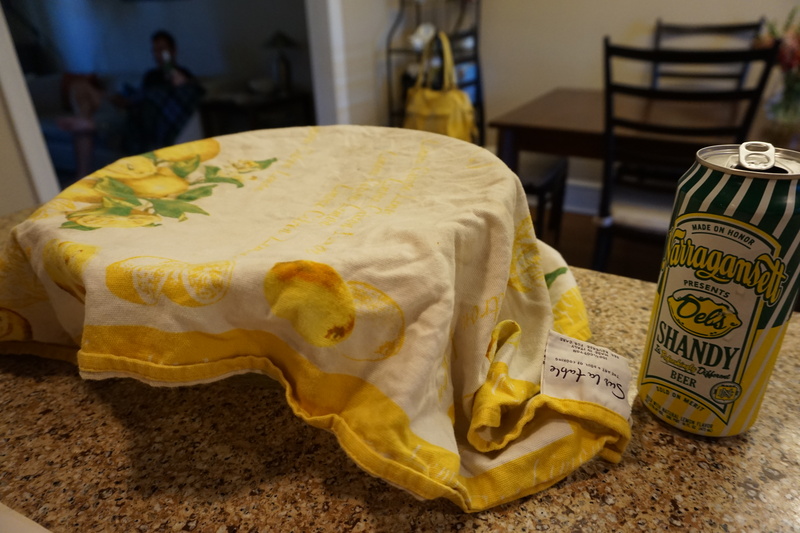 Once you have gotten it to a good place, drizzle it with olive oil so it easily goes on to the grill and won’t stick to it (added benefit is more flavor). 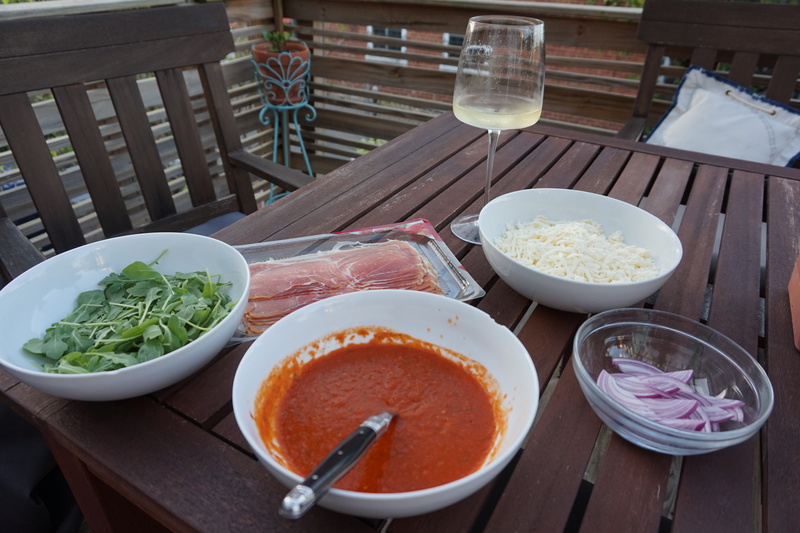 Before you light your grill make sure to get all of your ingredients ready so once the dough is ready you can immediately put them on (wine optional but makes pizza mistakes go down much smoother). Also make sure to not add too many elements. Last thing you want is a soggy pizza. Heat your grill to high (apologies to everyone but we have a gas grill so all instructions are for gas but its easy enough to modify to charcoal, just move your food away from the coals for indirect) and let it get as hot as it can with the lid closed. Once it’s nice and hot, turn the burners to medium just where you are going to put the pizza and leave the rest on high. Add the dough and close the top. Don’t peak for 3 minutes – after that lift up the cover. The pizza should have nice char and lines on the bottom and good bubbles on top. 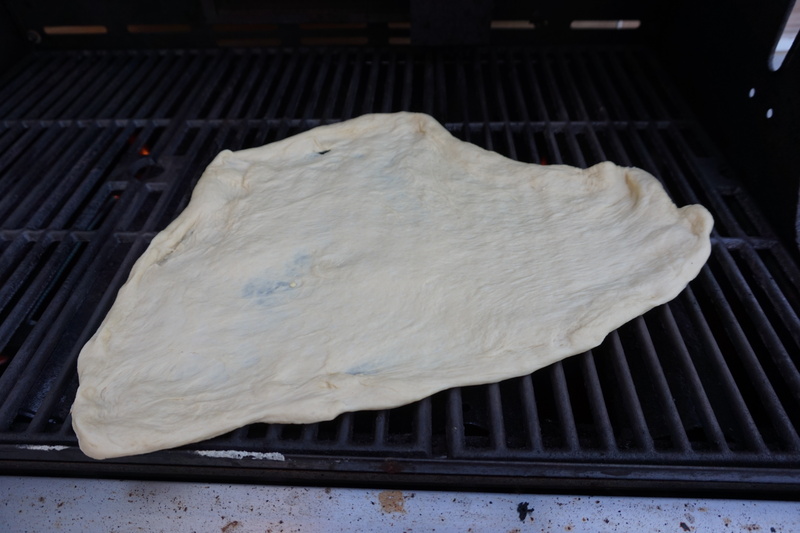 Slide the pizza off and flip it so the grilled side is up on your pizza peal or cookie sheet. Add your toppings – for the Nustello pie add tomato sauce, cheese, prosciutto and onion. Trust your gut – depending on the size of dough you rolled out you may need less toppings, so just make sure not to overload it. Once all the toppings are on move the pizza back to the grill and turn off the burners immediately below the pizza. Since the cover has been closed the whole time the grill still should be nice and hot. Close the cover again and let it cook for at least another 7 to 8 minutes. Check and see if the cheese has melted – it can take up to 12 minutes so just peak when you need to. Once its done take it off the grill and top with the arugula which will start to wilt on contact. You want to wait a couple of minutes (tough I know!) before you cut into it. Since I made my dough I just let it rise on the counter and hang out until I was ready to use it. If it has risen again all you have to do is punch it down. If you bought your dough just make sure it is nice and room temp. Flour your surface so it doesn’t stick and just start working the dough into a flat circle with your hands. 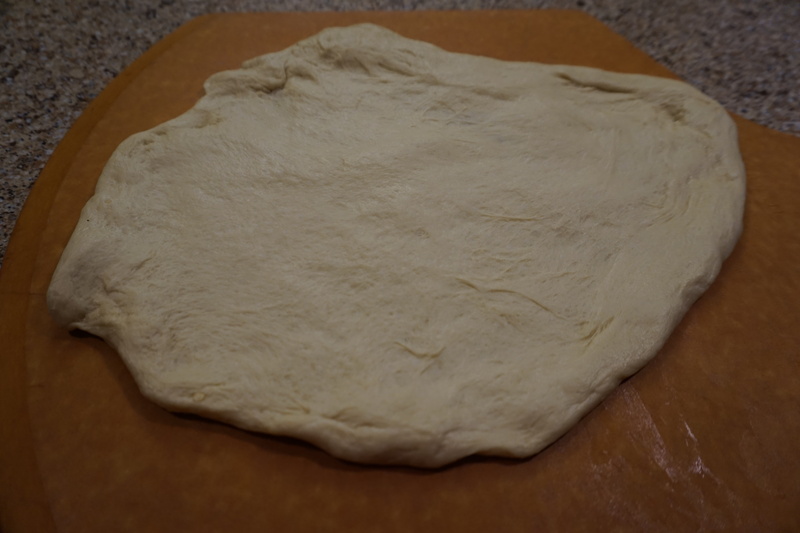 There is no real trick to this, you just stretch your dough until its thin and in the shape you want. I would suggest starting with smaller pizzas for your first try as its easier to control. Don’t worry if some parts are thinner than other, again this is part of the charm. Once you have gotten it to a good place, drizzle it with olive oil so it easily goes on to the grill and won’t stick to it. Before you light your grill make sure to get all of your ingredients ready so once the dough is ready you can immediately put them on. Heat your grill to high (apologies to everyone but we have a gas grill so all instructions are for gas but its easy enough to modify to charcoal, just move your food away from the coals for indirect) and let it get as hot as it can with the lid closed. Once it’s nice and hot, turn the burners to medium just where you are going to put the pizza and leave the rest on high. Add the dough and close the top. Don’t peak for 3 minutes – after that lift up the cover. The pizza should have nice char and lines on the bottom and good bubbles on top. 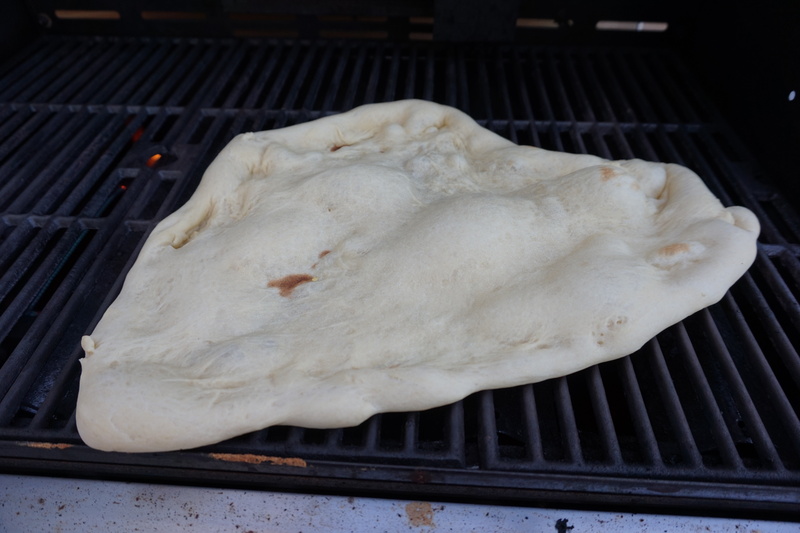 Slide the pizza off and flip it so the grilled side is up on your pizza peal or cookie sheet. Add your toppings – for the Nustello pie add tomato sauce, cheese, prosciutto and onion. Trust your gut – depending on the size of dough you rolled out you may need less toppings, so just make sure not to overload it. Once all the toppings are on move the pizza back to the grill and turn off the burners immediately below the pizza. Since the cover has been closed the whole time the grill still should be nice and hot. Close the cover again and let it cook for at least another 7 to 8 minutes. Check and see if the cheese has melted – it can take up to 12 minutes so just peak when you need to. Once its done take it off the grill and top with the arugula which will start to wilt on contact. You want to wait a couple of minutes (tough I know!) before you cut into it.